After two drunken cowboys cut a prostitute’s face in Big Whiskey, Wyoming, the group of prostitutes working at the Billiards Saloon collect all the money they own and offer a handsome reward for whoever kill the guys who disfigured one of their own. 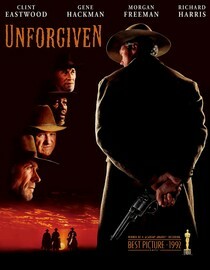 Retired assassin William Munny is recruited by a youth to kill those two men and collect the reward. Munny doesn’t commit, but goes to his former partner Ned Logan to offer this last job. Both Munny and Logan find the youth on their way to Big Whiskey and all three decide to split the profits, but soon things get complicated for Little Bill, the town’s sheriff, and his deputies won’t allow anyone to bring firearms into their town. Outstanding performances were delivered by Clint Eastwood, Morgan Freeman and Gene Hackman, who won an Oscar for that role. Good musical score too! The script is also brilliant and casts the Old West in an otherworldly light, for sometimes villains have more honor than the men of the law.